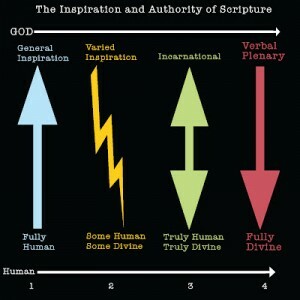 How do you view the inspiration of Scripture? Over at Video! Audio! Disco!, Joshua M. Walters has posted a great little excerpt from The Indispensable Guide to God’s Word by Donald J. Brash that helps you sort through the four main options for how you might understand the inspiration of the Bible (or any religious text for that matter). Well worth the ten-minute read. BTW: I think this discussion is fundamental to any discussion about hell, b/c if we can’t agree on what the Bible actually is, experience has shown me the conversation can’t really progress very far from there. Thanks for the link. Great article. Also, thought I’d let you know that I really enjoyed the Beyond The Box interview. Glad you enjoyed it, Heath. And thanks so much for your comments here. The free will debate is far from simple. And as even Sam Harris admits, the true motivations for our choices is a wilderness. So I see plenty of room for what you’re talking about in terms of the “light of Christ” inside a person. I don’t think Beck would disagree either. I don’t think anyone is negating the idea of humans having a will. The question is, what is influencing our will, and to what extent? I also think that many discussions about free will tend to be highly individualistic. For example, where does my will end and yours begin? As Rene Girard says, we aren’t so much individuals as we are “interdividuals.” This is the irony: Many Christians who defend hell with a strong view of free will criticize universalists like Beck or Rob Bell of pandering to post-modern culture. Meanwhile, their view of hell is so highly individualistic that I think you can make a much stronger case that the so-called conservatives are merely products of the culture they criticize. Another aspect to the free will debate is the fact that some people have personalities that are more inclined to not be followers. Some people are more inclined to align themselves with Christ’s will for their lives. ect. ect. Another aspect is what science is learning about “Morphogenic Fields” or the idea that there is energy connected to people which stores some of their memory (It’s hard to explain). Some scientist think that one persons morphogenic field can influence another person under certain conditions. If true this is then another possible influence on our wills. As to so called conservatives, one of the great ironies is that in our day and age the “conservatives” have a system that has bought into a great number of the changes that have been made to Christianity over the last 2,000 years (including the Augustinian understanding of the fall and human nature, the penal substitution atonement theory, and the Dantes Inferno influenced view of “hell”. The “conservatives” are often really the “old liberals” . in that narrative a whole lot of themes–including man’s purposes, sin, organized religion, the calling of israel, and the kingdom of god–become important. i think what we ultimately need to realize is that while the bible does present a holistic story, it is not just one thing, it’s many different themes and narratives culminating and interweaving together, with both man’s and god’s voices intertwined.